While in the very beginning you may have a mentor or someone to supervise your first few weeks, after that you’re on your own. It’s ok to be confident. You graduated from an accredited program, just like all of your co-workers. You’ve got your license (or not, but it’s on its way!). You won’t know the answer to everything and you don’t have to. More on that later. What you don’t want to do is demonstrate confusion or uncertainty in front of patients. Scenario: You walk into a patient’s room, and they are frustrated that the doctor has not come in to speak with them yet. The patient wants to know about the x-ray results and blood draw they took this morning. Introduce yourself, and explain why you are there. Repeat the patients question back to them, to show you heard their concerns. Inform the patient while the doctor is the one who will come in to discuss the results with them, you will follow up with the nurse to see how long it will be. It goes without saying that the nurses and patient care technicians (PCTs) are the most important staff on the floor. Your working relationship with this staff can make your job easier or harder. The best advice I ever got from a CI was to take time to introduce myself to all the nurses and PCTs as I went through my caseload for the day. This shows the nurses and staff that you care to get to know them. I also make sure to check in with the staff (nurse or PCT) if it is a good time for me to work with a patient. They will know whether a patient has a procedure coming up, had a bad night and may be too tired, in too much pain, or is speaking with the doctor. While also saving you potential time, they will appreciate the time you took to consult them. Case Managers/Discharge Planners (CMs) are also an important part of the team. As a PT, you will be spending a significant time working with CMs to create a safe discharge plan for your patients. Sometimes these are complex and require unique strategies, especially if the patient or family refuses to go the route of a skilled nursing facility. CMs also appreciate a heads up if you get to the patient first and the discharge process might be complex, or the original plan has changed. CMs are also a great informational resource, and can provide materials and education for patients and their families on what support services are available in the patient’s area, or what their insurance will cover. It’s ok to be cautious, especially as a new grad learning the ropes. We are trained to recognize, disseminate, and evaluate if the patient is safe to mobilize. Sometimes you will disagree with doctors, nurses, and other staff on the relative safety of the patient participating in PT. Things like hypotension, hypertension, anemia, and goal coagulation can affect the safety and therapeutic benefit of mobility in the acute care setting. It is your primary job to be an advocate for your patient and their safety. You also have the right, as an autonomous licensed health care practitioner, to refuse to treat the patient on the grounds of safety. Scenario: As part of your evaluation of a patient post-operative day 0 for total knee arthroplasty, you take baseline blood pressures in a rest position. This will allow you to evaluate the response to exercise, and potential post-operative effects of anesthesia. Noticing the BP is lower than the pts pre-operative numbers, and an orthostatic change to sitting coupled with dizziness and lightheadedness. You report these findings to the nurse, and that with positive orthostatic it is unsafe to stand or walk with the patient. The nurse responds that this is normal after surgery and to just get them up anyways. At the end of the day, you are the one responsible for the patient’s well-being and safety during your sessions. Trust your Gut! 4. Don’t recognize the lab values or chart information? LOOK IT UP! You are not going to be able to remember all the lab values and their respective effect on safety with mobility or radiology reports. That is ok! This isn’t like a school exam, practical, or board exam. If you are not already a member of the American Physical Therapy Association's Academy of Acute Care of Physical Therapy, now is a good time to add the section to your membership renewal. To do so, login to The American Physical Therapy Association website, click “Go To MyAPTA”, and scroll down to the Membership section to add other sections. Once you are a member, you will have access to great resources like Clinical Practice Guidelines, Core Competencies, and Laboratory Values Interpretation Resource to help guide your practice. Acute Care is an interdisciplinary environment. Besides our rehabilitation counterparts like Occupational Therapists and Speech Language Pathologists, you will find yourself working with specialty nurses (wound care, cardiac educators, etc), respiratory therapists, chaplains, behavioral health professionals, social workers, and palliative care — just to name a few. 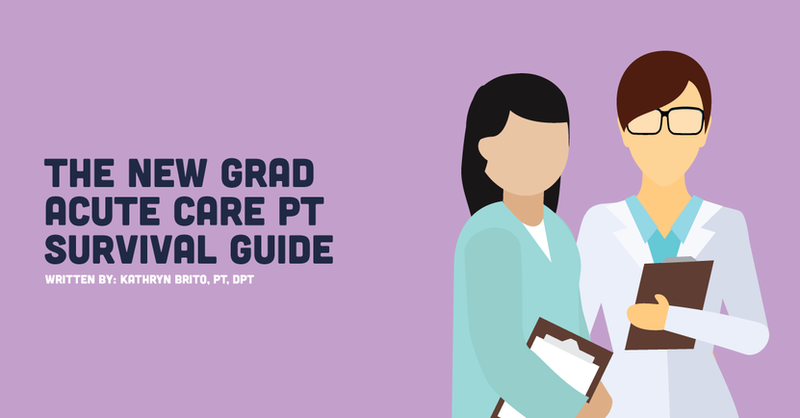 As a new grad you need to learn more about these other services in order to make appropriate recommendations if the patient needs other services. Reach out to your manager and see if you can spend a hour or two shadowing these other disciplines to get a better understanding of what they do. This will help when working with patients, as they often have questions about their care, and what specialties they are working with. You also may find yourself at times working side by side with these professionals in co-treats. Observing Surgery. If your hospital allows it, do it. Patients often have lots of questions, and they do not always remember to ask the doctor, physician assistant, or nurse. This will allow you to answer basic questions about the surgery. Word of Caution: This is for basic questions and understanding about surgery. Something simple like “Did they use staples or sutures?” for example. Your co-workers will have a wealth of clinical experience and understanding of hospital culture to share with you. Be open minded about what they have to say! Just because it doesn’t match up with what you learned in school doesn’t mean that it’s wrong. Many of your co-workers will be quick at recognizing patterns with patients, presentations, and understanding the doctors in your hospital. This will be key to survival in your early days until you develop your own tool kit. They are also your key to introductions with other staff, remember what I said about the nurses earlier? Don’t be afraid to share your experiences in school and what you have learned. Your coworkers have a wealth of clinical experience, maybe because they have been in the field for the last 20 years, but you can provide a different perspective and understanding as a result of newer evidence taught in school. You are just as capable of teaching them new things as they are of teaching you. This isn’t a ding against them! The profession has changed, and so has the standard curriculum, meaning you learned more in school than they did when they got their degree. In most cases you will find that your co-workers are willing to hear about what is new in the PT world. Offer to explain what you learned in school, read in recent research, or learned at another clinical, and its implications for PT in the hospital. Maybe you will find it easier to present via an in-service for the staff or create a competency. On the other hand, sometimes that staff may be resistant to changing the department culture and adjusting methods of practice to follow evidence-based recommendations. Rome wasn’t built in a day, and don’t expect to make a major, or even minor department change in one day, one month, or even one year. The better relationship you have because of open honest communication, the smoother both of your lives will be. I asked my manager what I could do to make her job easier if she hired me during the interview. Right from the bat I wanted to show her that I was serious not only about this job but working with her to make our department better. Want to learn what other questions I asked to show my manager how much I wanted it, and the kind of employee I’ll be? Read up on these common acute care physical therapy interview questions! Her response? “Open and honest communication. You are human, and humans have bad days, humans have families that have emergencies, sometimes patients take an emotional drain on you as you support them.” She went on to say that she wanted me, especially as a new grad, to feel comfortable coming to her even with silly questions, because she would rather help me understand and work through it together, than make me feel like I had to figure it out on my own. I took this to heart and have since made sure to bring stuff that I do not understand to her attention, or questions about hospital policy and procedure. Most recently it was a legality issue when dealing with a particularly difficult patient. She was happy to work through the chart and note I wrote with me and identify better ways in which to word my note, and prevent opening up the hospital, or myself, to a lawsuit. Don’t be afraid to ask for help with assessments/notes, and having your manager spot check them will help you become a better therapist! Hopefully in your interview you were upfront with asking what the productivity expectations were for full time staff, and more importantly, what the expectations are for a new grad. If you did not get that information during your interview, check in with your manager as soon as possible. Nothing can overwhelm a new grad more in any setting than high productivity expectations, especially while trying to learn how to manage a full caseload independently for the first time. My manager gave me the best advice when it came to productivity in acute care. “It’s called acute care for a reason. Sometimes the patients are so acutely ill or injured they are not appropriate for therapy or cannot tolerate a 30 min session.” She went on to say that as a manager, she gets that there are some days or weeks when all the patients just seem to be inappropriate for therapy. For example, it could be 3pm on a Wednesday, and as a new grad you’ve seen only 3 patients and charged for only 5 units because 2 are not stable enough and one refused. This is ok! Even season PTs have days like that where the luck of the draw just isn’t there. Don’t quite understand productivity or why it’s important to a hospital/clinic? Read up on productivity and why you should care. Above all else, remember that you are sometimes a patient’s first encounter with a rehab professional at a time when they are at their most vulnerable, exposed, and uncomfortable. Treat them how you would want your family members or you to be treated. Introduce yourself and say goodbye with a hand shake. Do this at their eye level if possible, find a chair or get down on a knee. Patients will feel more comfortable speaking with someone eye to eye with them, then someone towering over them in the bed. A nurse once told me that a lot of her male patients feel so much better after she offers to give them a shave, because it makes them feel human again! Treating them like a human being shows your patients that you care. Offer to get them a warm blanket, extra pair of socks, ask their PCT to get them a shower, or help them get pants on if they can. This is something they don’t teach you about in school, but in order to take care of patients, you have to take care of yourself. There are many times in the hospital that as a PT, your patients’ stress becomes your stress. You will lose patients, patients will be difficult and not listen to you, family members will project their feelings onto you or express their displeasure at the care you provide. Other times you just happen to get patients that have extensive psychiatric histories that will drain you emotionally and mentally as well as physically. It’s important to have a good relationship with your co-workers if you need to vent or talk through an issue. Having a good relationship with your manager can also provide you with an outlet to talk through difficult cases, like I mentioned about above. Try not to bring your work home with you. It can be hard after a long day and difficult patients, but home is a place to rest, relax, recoup. Take time for yourself, find a hobby, get regular massages, workout, hang out with friends, or go see a movie. Chances are if you are reading this you haven’t done something for yourself in well over a few months. So close your computer, close your internet browser on your phone, text a friend or go out and treat yourself!